What's better than laying in a hammock, enjoying the warm ocean breeze? 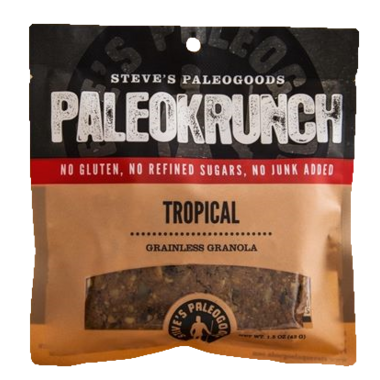 Enjoying Steve's PaleoGoods Tropical PaleoKrunch Bar when you're in that hammock! This bar is gluten-free and grainless with all-natural pineapple, raw macadamias and extra coconut to give you the best of salty and sweet. It feels like a treat, but it's packed with good nutrition. PaleoKrunch bars fit easily into your to-go bag and your healthy lifestyle. Pair it with some jerky for a complete meal, or eat it alone for a healthy and delicious snack. Ingredients: Almonds, Shredded Coconut, Macadamia Nuts, Dried Pineapples, Sunflower seeds, Pumpkin seeds, Coconut Oil, Honey, Sea Salt. PRODUCED IN A FACILITY THAT USES NUTS.